For durability, affordability, and easy maintenance, there’s no better choice than laminate flooring for your home upgrade or remodel. With the ability to mimic almost any species of wood, you can have the appearance of beautiful and exotic hardwood floors at a much more affordable price and with a much easier cleaning routine. Find a perfect combination of style and function with our collections of laminate wood and laminate tile flooring. Engineered using four layers, laminate wood flooring offers higher levels of durability, standing up to heavy foot traffic and sunlight exposure with ease. Even children and pets are able to play on laminate floors without having to worry about damage from scratches. Count on our laminate flooring installation to protect the investment in your new floors. Whether you’re going for a homey, rustic theme with your home’s décor or a modern minimalist look, laminate wood flooring offers the best variety to suit any style. From the appearance of smooth, aged oak to the ambiance of a hand-scraped wood floor, any look is within your reach as well as your budget with laminate floors from our collections. In addition, our flooring specialists are happy to guide you every step of the way—from selection to installation. Due to the specialized manufacturing process of laminate floors, it is relatively simple to care for and maintain laminate wood flooring. During a thorough treatment and acclimation process, each laminate piece is treated to be water, stain, and gouge resistant. The outer coating also helps prevent your beautiful flooring from fading or discoloring in the sunlight. To care for your laminate flooring, a microfiber dust mop is best for everyday cleaning. Avoid using water, because although laminate floors are water resistant, frequent or prolonged exposure to water may warp your tiles. For more extensive cleaning, use a laminate-specific cleaning solution. With laminate tile flooring, you’re able to enjoy the classic and timeless style of hardwood floors without the expense and specialized care. Because laminate flooring is made using compressed fiber board materials and a melamine layer rather than synthetic materials, your laminate floors offer the same feeling of warmth underfoot that hardwood floors are famous for. When you choose an exotic woodgrain appearance, you have the added benefit of knowing that your floor doesn’t require the use of potentially at-risk species of trees. 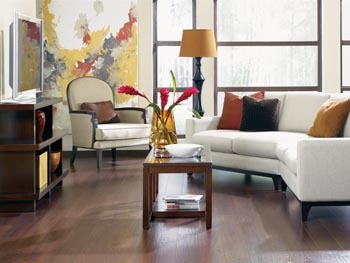 Laminate wood flooring offers all the beauty of rare wood flooring without the environmental drawback. To make sure your laminate floors are installed properly and on a level surface, allow our flooring specialists to provide laminate flooring installation. Laminate flooring requires time to acclimate to the temperature and humidity of your home, and special preparation to ensure it remains smooth and level for many years. Take the stress and guess work out of installation and allow our professionals to handle it with ease. Contact us today to select your new laminate tile flooring and schedule laminate flooring installation by our experienced professionals. We proudly serve Anderson, SC, and the surrounding area.